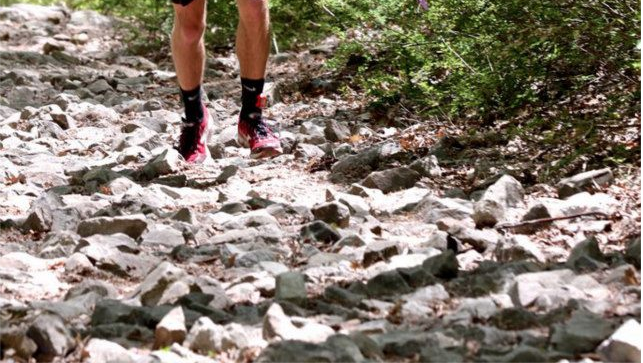 I’m really not sure what to write as far as a race report — not to give too much away, but there were a lot of rocks and a few hills, and I ran a long long time. But saying that doesn’t make for a good report. 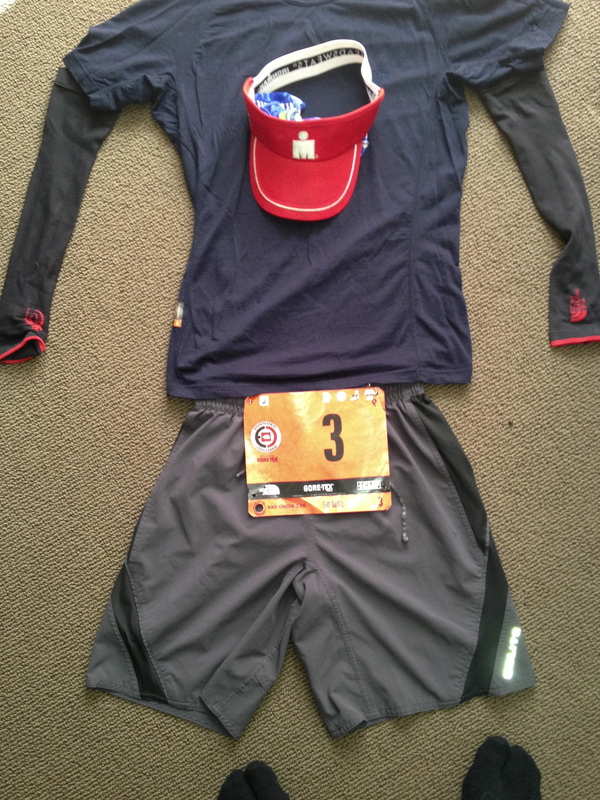 Yet it’s been a long time since I’ve not written a report for a big run, so here goes. After that Rob picked us up in the city, we got some lunch, etc. We hung out Thursday and Friday before getting up at the somewhat insane hour of 2:45 to leave the house by 3 and drive the hour over to the park. (The coffee was an auto, so what else is there to do except get up and go?) I fell asleep just after 8:00 p.m. without much trouble, but did wake a couple times — once about midnight and next around 1:30, at which point it was difficult to go back down for another hour. But all in all not bad. 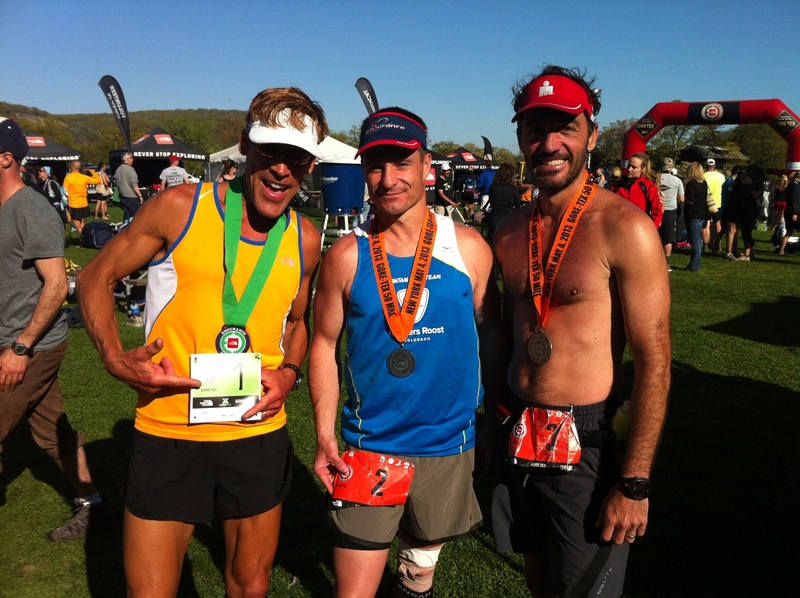 North Face puts on a really good event — it was not much different from the GA 50 I ran in 2011. So everything went smoothly and we waited for the race to start. Ben had put a predicted time of 10:00 down while I had put down 11:00, so we were in different waves. We had planned to start together none-the-less, but then the announcer was giving all these dire warnings about your chip time being tied to your wave, yadda-yadda-yadda. I decided to start behind Ben mostly because if I had started with him, I’d probably have gone out way too hard. My goal in this race was to train for Leadville, and not push too hard. I really didn’t want to kill my training in the following weeks, but at the same time, I wanted to gain strength for Pb. Though that’s just one example. Besides little sharp rocks, there were little round rocks, and big sharp rocks, and boulders, and a huge ridge that was all just one or two giant granite faces. I’m sure some of you want me to compare Bear Mountain to Uhwarrie. So here it is. The hills in Bear Mountain were about the same. See this post. 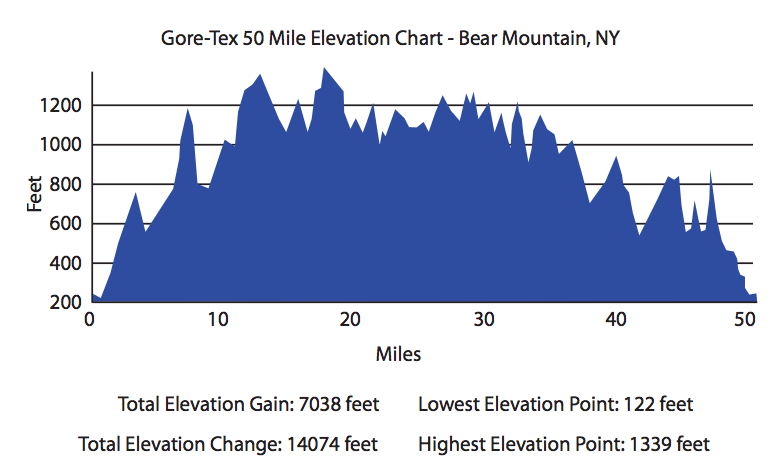 If anything Bear Mountain hills were longer in terms of miles, but overall the steepest hills in NY were about the same steepness as those in Uhwarrie. And Uhwarrie has some very rocky sections — just as technical as the rocks in Bear Mountain. But Bear Mountain is a bit more relentless than Uhwarrie in terms of the rocks — both rock fields with no discernable “path” for the trail, and boulder fields, etc. Bear Mountain had longer “runnable” sections than Uhwarrie. The last 3-4 miles of NY is quite a bit of down, but I was able to run it all because I had not run large sections earlier — due to the rocks. If I had to pick the harder course I would say NY — it’s 10 miles longer for one! But the rocks do get to you if you are not used to them. And Ben from CO said it’s the most technical trail he’s run for 50k’s and 50 milers. So there. 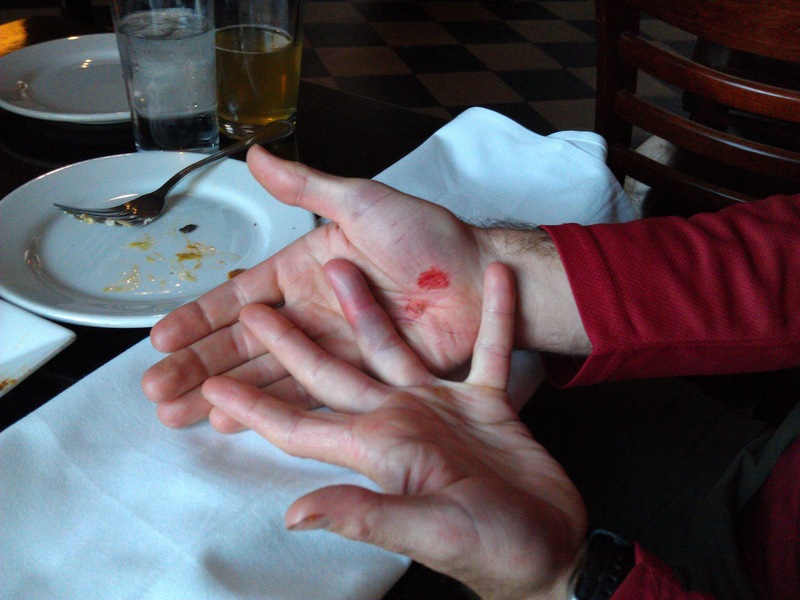 I had a pretty good fall about 90 minutes in… Went down hard on both my right palm, my right knee, and somehow that I still haven’t figured out, my left ring finger. I mostly noticed the big scrape on the right palm at 1st, and a bit of numbness in the finger which I thought might be due to the cold, but it turned out to be more than that. I didn’t notice the R knee until the guy I was passing during the fall commented on it. Said “that’s gonna hurt later.” Thanks! It stiffened a bit during the run but never really slowed me down. I was definitely more timid for a while and took far fewer risks on the rocks after that. This one is a bit embellished with an Instagram filter — but it was blue! Ben’s ITB started bothering him and I caught up to him at the 27 mile aid station. We ran together for a bit but then I pulled away as he was mostly walking. However, around mile 44 he came flying by — he had received some Vitamin I which masked the pain, and he was in a hurry to finish before it wore off! He came in at just under 11:43. When I hit the last Aid Station at mile 47 I had something like 32 minutes to break 12 hours — a far cry from the 11:00 I thought I’d run. Since I’d been averaging 13-14 minute miles, it was going to be tough. But the rocks finally subsided (mostly!) and I could run, and I did the last 3 in about 28 minutes. My guess of an 11:00 hour finish was before I had seen the course, and to be honest, I’m actually quite happy with the 11:58. I feel like I had a good run, I didn’t give it 100% (it wasn’t an A race), and 3 days later I feel pretty good. I *am* surprised that I was 121st out of 275 finishers. I’m normally a bit further up — towards the front 1/3 of the pack. But I really think the runners in NY were a strong bunch and it’s not about me not running well, but it being a strong field. Again, I feel like I had a great race. We had to get a picture with Dean, wearing his #1, Ben in #2, and me in #3, even if you can’t see my number. After finishing we grabbed our gear bags, a bit of food, and I went to the medical tent so they could clean up my knee. The medic suggested I get the ring off the finger in case it continued to swell, and I’m glad I took his advice! 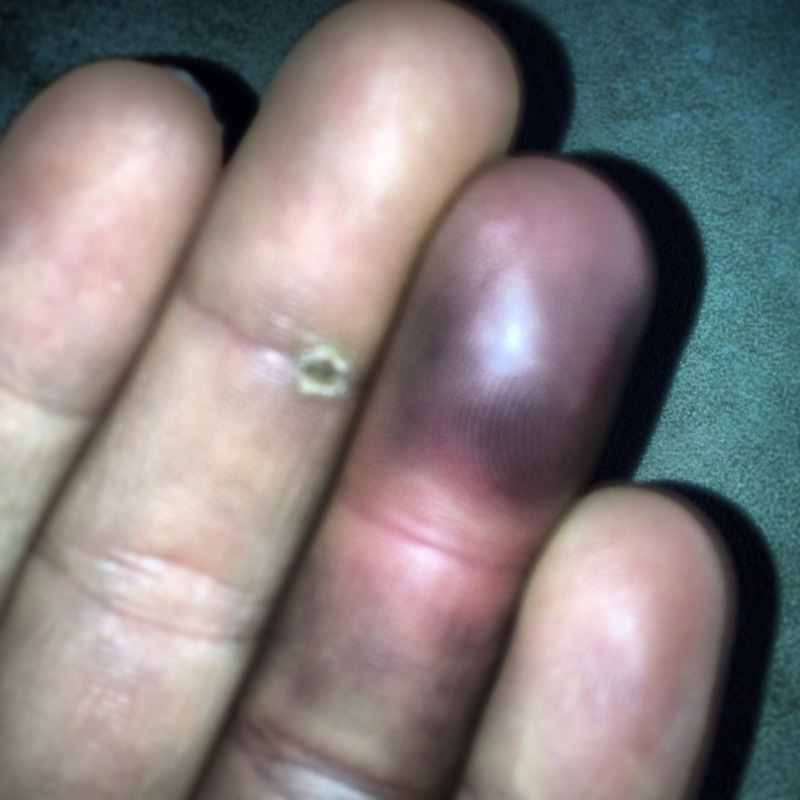 It hurt even with Vaseline but it probably would have been stuck the next day as the finger continued to swell. We headed over to Peaskill for a nice celebration dinner. 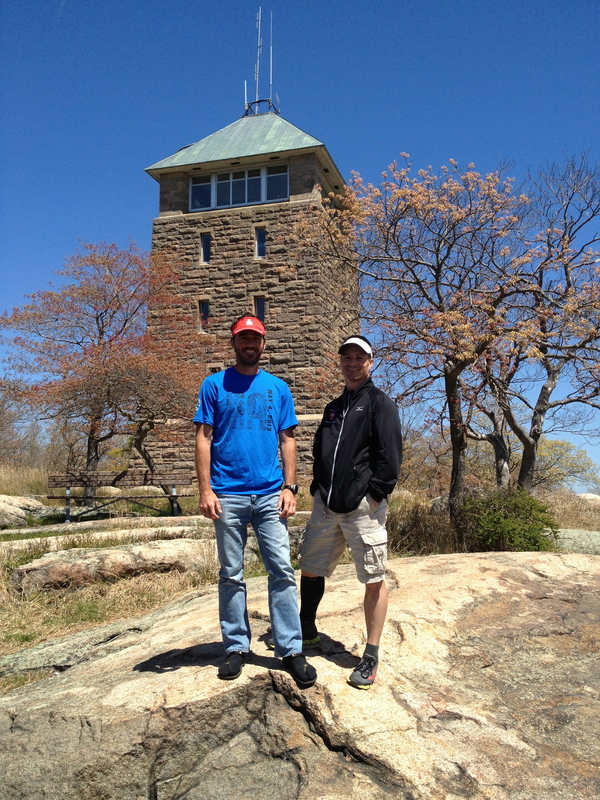 On the way out we drove to the top of Bear Mountain and saw the tower. The run does *not* go up here. Would I run this course again? Certainly! 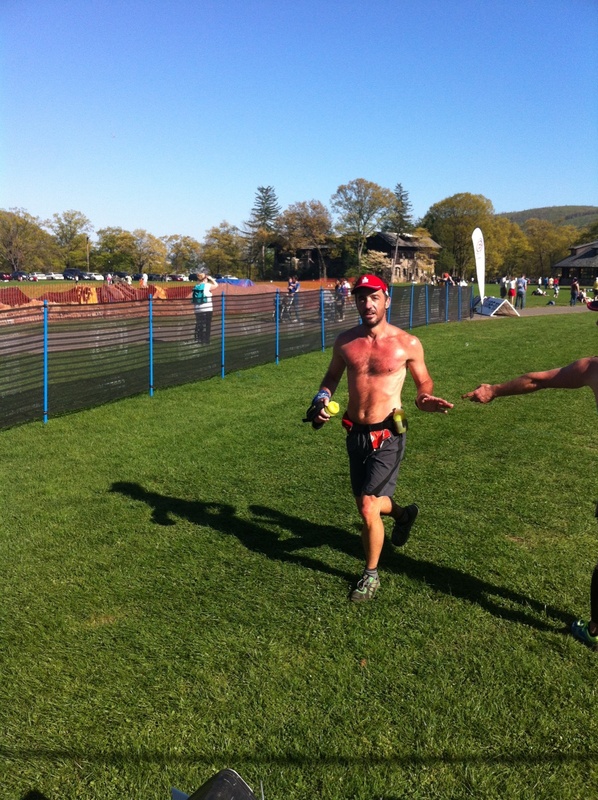 NF puts on great events, and while this was a *tough* course, it was still fun. It would all depend on who else was running, if I had a need to be in NY or a need to get in a 50 for training or qualification purposes, etc. I.e. I may not go out of my way to run it again, but if there’s a reason to, I wouldn’t hesitate. Shoes: Altra Superior. Only my 3rd for 4th run in them though I had done a 15-er so I was comfortable going in. I had the Mix Master 2’s in the drop bag at 27, only to use if I had a serious blister or some such. I.e. I would not have “downgraded” protection from the Superior to the MM2 without some kind of a problem. The shoe did fine but around miles 35-40 to the end I was about ready to mug anyone with Hoka’s. Just kidding. Kind of. I’m still seriously thinking about a pair of Hoka’s for the latter stages of Leadville. Nutrition: I used ViFuel as my base. It was a real pain squeezing the individual gel packs into my 8 oz amphipod canisters the day before — ViFuel you’ve got to start selling in bulk containers!! I also used BCAA’s (MAP) and Endurolytes that I carried in a plastic baggie, 2-3 each about every hour. Probably need more like 5 MAPs to do any good, but it’s all I had. In addition to the ViFuel as my base I ate from the aid stations — 3 or 4 banana quarters, 1 orange quarter, and several boiled potatoes sometimes with salt, sometimes without. I had a few potato chips and a couple of swallows of soda (pepsi/coke and mtn dew). And that was it. I’d guesstimate < 2000 calories total. I’ll have more real food in the upcoming 24 hour run (Black Mountain Monster) and in Leadville, I’m sure. But this worked out well — never felt hungry nor nauseous. Glad to hear that the Superiors worked for you. Sounds like the right sort of course for them (rocks!). Just wanted to point out that the Army 10 miler is in October…and that Lake Effect is in February. An done more thing…next year, I want in!!! Nah…it was more like 7:06 or something…the Lake Effect was a 1:35…with my stress fracture. I just registered to do the marathon length for the ECS this year and appreciated your recap! I’ve done a 50 Miler upstate in New Paltz and finished half in ~6 hours but I’m still nervous for the cutoff time for this one. Do you have any helpful tips on training or about the course? Anything to keep in mind such as which areas will take longer than others? I’m can definitely say that I’ll be eating some rocks but I’m hoping this will be due to my usual clumsiness rather than a lack of preparation. Thanks! Allison – I don’t remember any sections being “longer” than others, but I can say it is very rock and technical, so all in all, it took longer than expected. There were flat sections where I would have liked to have run — but the rocks were too bad! There are some beautiful sections in the middle, but I’m not sure if the marathon hits those or not.